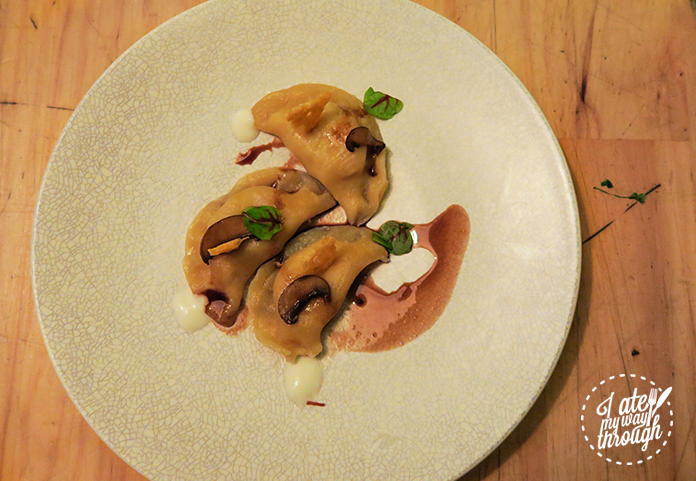 From the dumpling menu, we tried out the Potato and Bacon Pierogi Dumplings ($14) with pickled mushrooms, buttermilk and red wine vinegar. These dumplings were deliciously creamy, and although there weren’t too many bacon and mushroom pieces, I still found it to be quite flavourful. 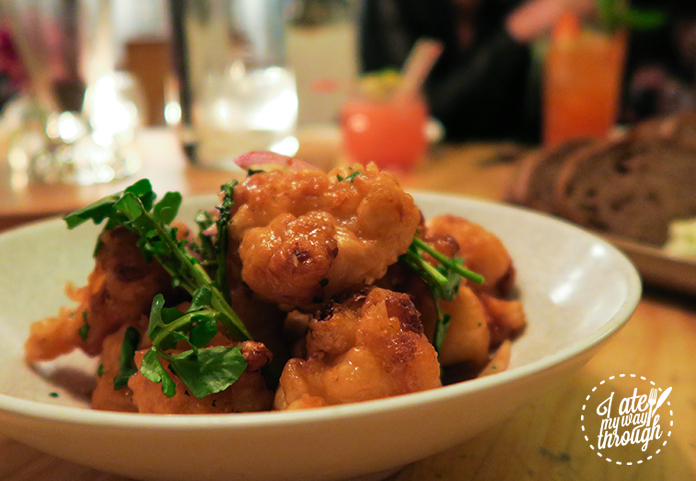 The Deep Fried Cauliflower ($15) with paprika, parsley, watercress and reduced red wine vinegar was a standout appetiser on the menu. 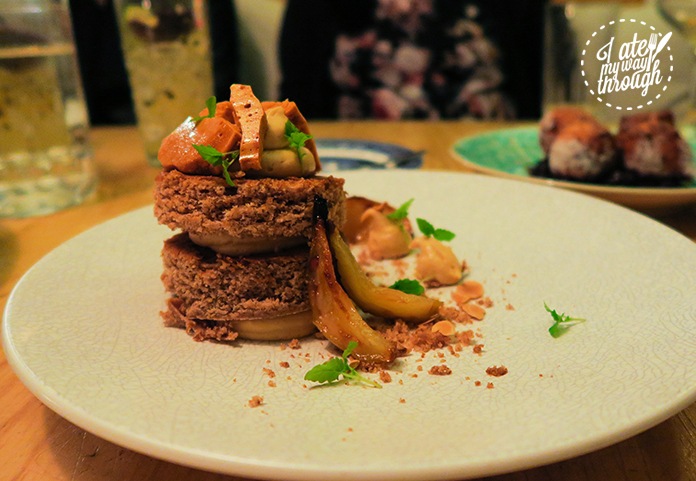 With honey added to the batter, this was one of Food Society’s signature dishes, comprising of a fried and caramelised layer which added a delightfully sweet and crunchy taste. 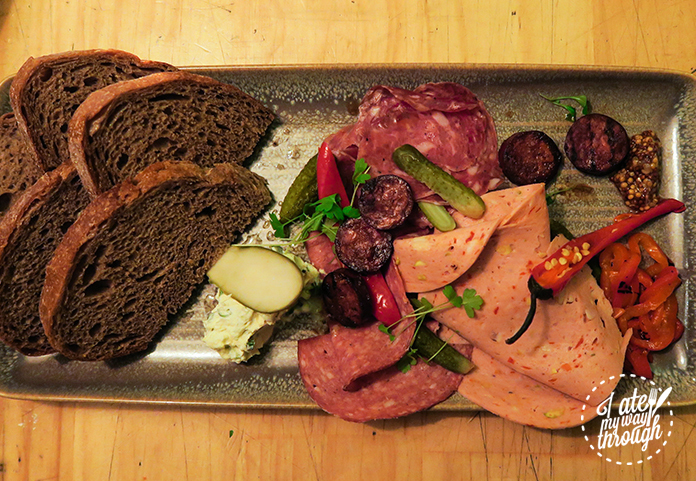 The charcuterie board of Cured Meats ($25) was a selection of truffled salami, chargrilled csabi, nduja & pistachio mortadella with chive cottage cheese, pickled vegetables and rye bread. The truffled salami had a nice spicey taste to it, but my personal favourite from the board was the chargrilled csabi sausage with its juicy, hot and slightly smokey taste. 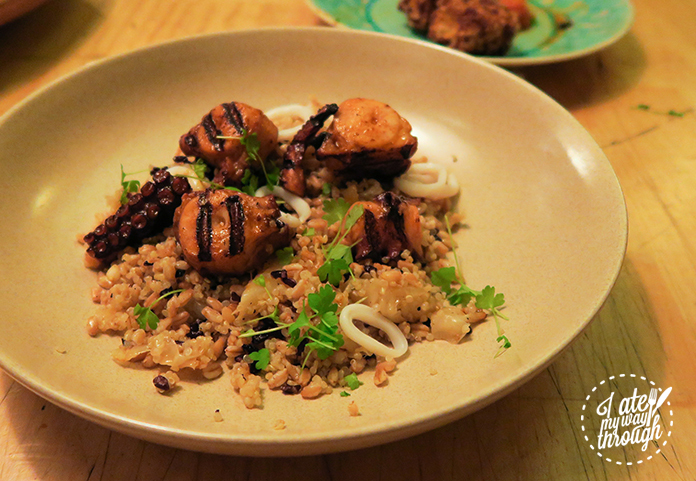 If you’re into your seafood, don’t go past trying the Octopus and Calamari Salad ($17) with mixed grains, crispy black rice and chard. The crunchy texture of the grains definitely complimented the softer texture of the grilled seafood. 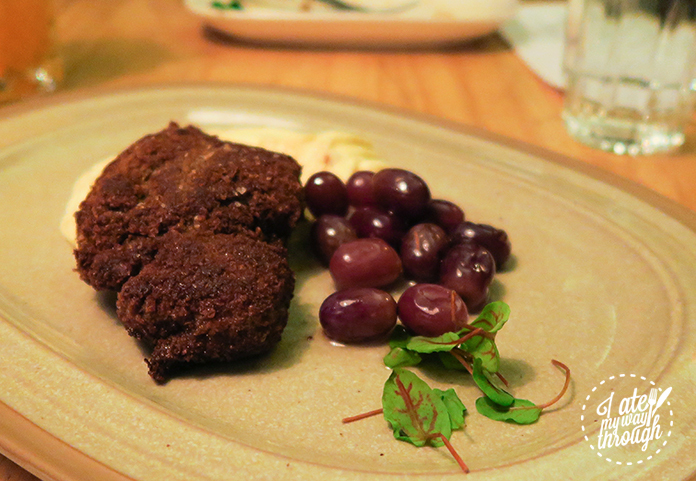 The Duck Breast Schnitzel ($26) with pickled grapes, baby herbs and celeriac cream was flavoursome with a nice crunch. 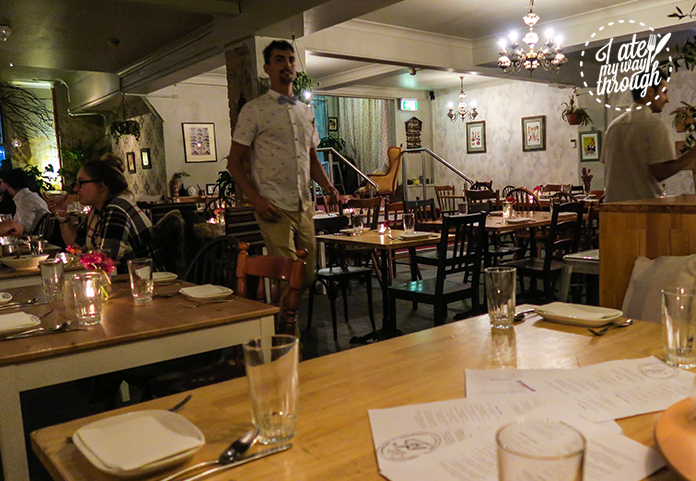 I was especially surprised with the pickled grapes and how well it rounded off the dish, adding a sharp tang and tartness with every bite. 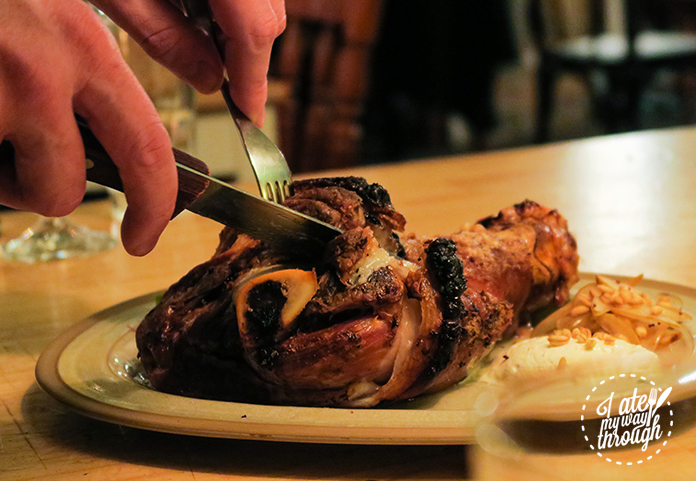 You know it’s going to be a great roast pork when its crispy on the outside and fork tender on the inside, and that’s exactly what the Slow Roasted Pork Knuckle ($34) with pickled apples, horseradish cream and mustard was. There was plenty of crackling and the applesauce was a great accompaniment. Sometimes adding honey into cakes can make it too sweet depending on the honey you choose. However, I found that the Czech style Honey Cake ($14), salted caramel cream, honeycomb and caramelised pears had just the right amount of sweetness. 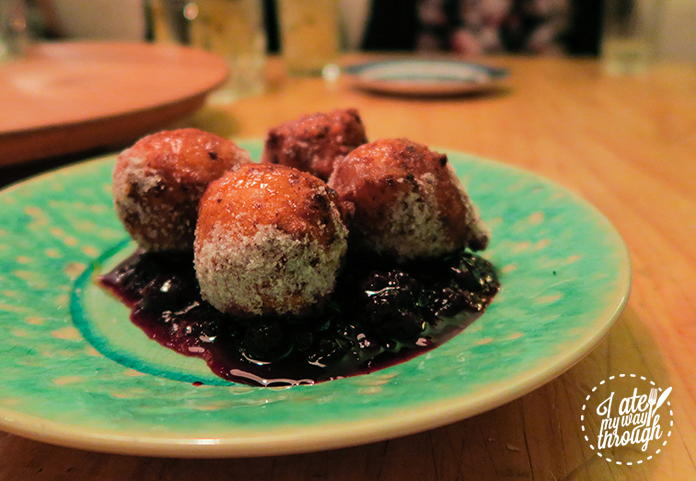 The housemade Ricotta Doughnuts ($14) with plum sugar, berries and amaretto honey was fluffy on the inside and crunchy on the outside. The berry compote was also a divine!